Paul ,All these top golfers do have straight left arms and their left foot doesn’t lift from the ground . It’s difficult if not impossible for average golfers like me to keep my left arm straight and I “help ” my shoulder rotation by slightly lifting my left heel . You are right,Raoul: but THE best players past and present do keep rheir left arm straight .I have photographies OF THE grand players from THE ‘ 20 s and ’30’s they all have their left arm straight .OF course THE left arm straigthens out when going in THE downswing ,so THE result is THE same .Curiously ,from THE photos I have ,VARDON,TAYLOR and BRAID had all three bent ARMS . Not sure if you’ve ever heard of a player named Jack Nicklaus? Take ruler and see if his arms was straight at the top. How about Fred Couples? Might want to check him too. Oh yeah, how about Count Yogi who actually taught people to break the arm at the top. 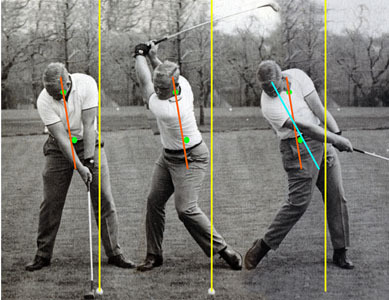 If the arm is bent it has to straighten by the time you hit the ball so you get to the widest arc. When people are trying to keep a straight at the top I feel they tighten the arms. So I teach extended but not locked. I thought I saw a comment about Nicklaus’ arm being straight but I can’t find it. Maybe you deleted it. I just did a quick search and found 2 pictures. You can clearly see that as a young man he kept it straight. In his prime he bent it. It is even bent in the early part of the downswing.